Watch a free Arabic lesson! What is inside the Arabic Standard set? Dino Lingo Arabic for Kids learning program teaches the most common 200 Arabic words and phrases in 6 DVDs. 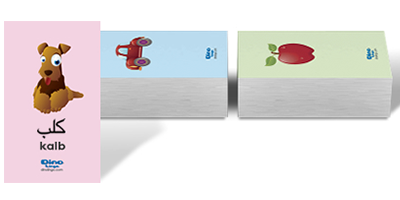 Dino Lingo Arabic learning flashcards teach the most common 150 words in Arabic. There are 150 total flashcards included in your bundle. Arabic Flashcard Set Categories: Numbers, Colors, Food, Fruit and Vegetables, House Items, Body Parts, Family, Clothes, Vehicles, Nature, Animals, and Greetings.